GLASGOW’S AHMADIYYA MUSLIM COMMUNITY LAUNCHES PEACE CAMPAIGN UNITED AGAINST EXTREMISM. It was a grey, overcast day when the planned United Against Extremism campaign launch was due in Glasgow’s iconic George Square. Whilst nothing would have dampened spirits or the strength of unity that was evident among those attending the launch, a bit of spring sun would not have been amiss. Scotland campaign manager Ahmed Owusu described the moment when the buses and media reached George Square in Glasgow, “As if by some miracle the clouds disappeared and the sun blazed through. Clearly God had answered someone’s prayers!” After Glasgow Murder, United Against Extremism Peace Campaign Launches tweet this But the interfaith community event was as much about prayers as it was about a show of solidarity. Only a month earlier Asad Shah, a member of the Ahmadiyya Muslim Community, was brutally murdered on the streets of Glasgow by another Muslim. The killer subsequently issued a statement saying this was done because Asad Shah had ‘disrespected’ Islam. This was Glasgow’s first killing of a Muslim by an extremist on grounds of faith. Glasgow was in shock. Mr. Shah was loved by many, as evidenced by the thousands who attended his vigil, raising more than $144, 000.00 for his family in honor of his memory. This was no ordinary reaction, but then again it was no ordinary murder. For decades Ahmadi Muslims have faced state-sponsored persecution in Pakistan where oppressive anti-Ahmadi laws introduced in 1974 and 1984 have resulted in a relentless hate campaign by extremists across the country, with hundreds of Ahmadi Muslims being killed. The Ahmadiyya Muslim Community, whose motto is ‘Love For All Hatred For None’ has always responded with prayers and patience and never with violence. 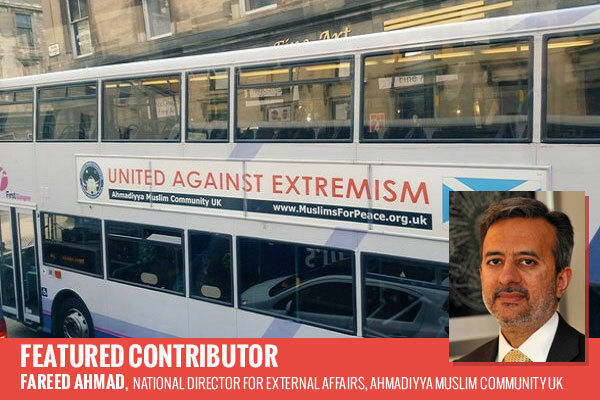 It is in this vein that the ‘United Against Extremism’ campaign’ was launched as the latest peace initiative of the Ahmadiyya Muslim Community and it has been running in the U.K. Since the 2015 Paris terrorist attacks. It has seen 100 buses carrying the campaign’s message in London, adverts in local and national media, remembrance events at mosques for the victims of extremism and terrorism everywhere and the door to door distribution of half a million leaflets condemning extremism. The Scotland campaign, featuring 100 buses across Glasgow, Edinburgh and Dundee, is part of this nationwide initiative and it has sought to bring all people together to send a clear signal that extremism has no place in Scotland. It been supported widely by faith and political leaders including British Prime Minister David Cameron, who praised the work as ‘commendable’. The community’s focus on peace reflects the tone set by its unique Caliphate, which is the antithesis of extremism. The worldwide head of the Ahmadiyya Muslim Community the Khalifa of Islam is His Holiness Hazrat Mirza Masroor Ahmad and in his many sermons and addresses across the world he continues to emphasize Islam’s unequivocal condemnation of extremism and the need for more decisive action by governments to nip the issue in the bud. These are not hollow words but are based on decades of experience and an overwhelming desire to create social cohesion, where all are safe to practice. The community has been at pains to alert authorities on the warning signs of radicalization and extremism it has experienced in countries like Pakistan, which often starts with intolerance of other interpretations and then leads to the violent suppression of other beliefs. Evidently the Glasgow murder is a wake up call for the U.K. and not too soon given the finding of hate leaflets in a mosque in London calling for the execution of Ahmadi Muslims. But the bus launch in Glasgow did offer some hope – it was very well attended by a wide cross-section of community, faith and political leaders sending a message of solidarity against extremism. The real challenge, however, is whether communities and governments can remain firm in their commitment to tackle extremism and its root causes with the determination and resolve that it so desperately needs. Share the post "After Glasgow Murder, United Against Extremism Peace Campaign Launches"